Great thanks to @ZoyeMasternodes for the cool article about StackOfStake. Now we got a "Careers" section at the website. The link can always be found at its footer. Learn what #vacancies are available, may be, you are the one our #team need! Out team is keep working on service improvement. Currently, we are hiring designer and front-end developer. StackOfStake is growing fast and soon we will open a vacancies of market analyst and security expert. Please, contact us, if you would like to apply to any of these positions. 2. Discord login. We have received several asks to add an ability to login through Discord. Now this function is live! Now you can Sign Up with Facebook, Twitter, Google+, Discord, as well as with email. 3. With new masternode proof function you can proof that the particular masternode is owned and running on StackOfStake. Just copy a Proof Sign and submit it in the "Message Sign" menu of your local wallet. Our service now become even more clear (and much more clear then any of our competitors). All our power is focused on moving to more advanced, secure and affordable servers. It will reduce our hosting expenses a lot. • SCRIV coin will be rewarded with exclusive 6% reward fee (instead of present 8%), making it lower than other mn coins. 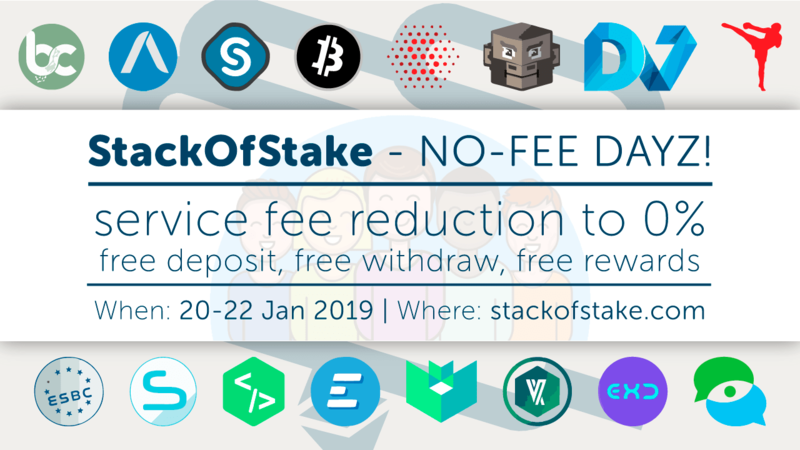 • We will implement StackOfStake Premium plan in future updates. It will give you an access to advanced analytics and functions. This plan will be paid in SCRIV coin. Join our Discord server to get the most fresh news! StackOfStake has passed it's first Security Audit. It was done by Cryptech Services project. All activities were conducted in a manner that simulated a malicious actor engaged in a targeted attack against StackOfStake Web Application with the goals of identifying if a remote attacker could penetrate StackOfStake’s defenses. There was 40+ manual and automatic tests done. And only 1 small vulnerability. The overall service security score - GOOD. We are happy to present you an official service guide! I like the video, gives a good explanation about your service! @sacrib Thank you for feedback! To celebrate the service update, we are launching the first “NO-FEE DAYZ” event. Event time: 20–22 Jan 2019. During these dates, all fees at our service will be removed. Our users will receive full rewards! @lova stackofstake has even better features than what is usually posted. I believe with this project, we could recover all our losses in the bear market. Every investor should get in here.